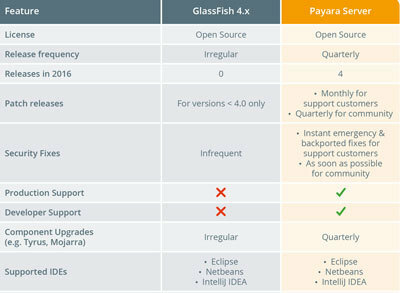 Regular, frequent releases – every 3 months you get a new and updated version of Payara Server with new bug fixes, patches and enhancements. Commercial support available, both for production and development, including 24/7 support with 1-hour response time for urgent production issues. Monthly patch release cycle for support customers, backed by emergency hot fixes to continually improve application security. Enhanced reporting and admin functions to create custom consoles or integrate with other JMX-based monitoring tools. Optimised for use in production: full web based admin console, supports rolling upgrades of Java EE apps, fully scriptable Command Line Interface, production support & more. Security, monitoring and DevOps features added, including Slow SQL Logging, Healthcheck Service, Asadmin Recorder and more. Support for modern cluster topologies through the use of Hazelcast. Docker support for rapid deployment of virtualised Java EE applications. Payara Micro for containerised application deployment. Vibrant community and high activity on the Payara GitHub Profile.